You are here: Home / Ethnic Groups / The People of Java / Who are the Bawean? The Bawean homeland is a 200 km2 island. It is 120 km north of Surabaya (East Java) in the middle of the Java Sea. Bawean has been known as the “island of women” because the majority of its inhabitants are women. This is because the men tend to look for employment in other lands. A man from Tanjung Ori village who worked for 20 years in Malaysia said, “A Bawean male is not considered an adult until he has stepped on foreign soil.” Merantau (going to distant lands to seek success) is a major aspect of Bawean culture, and it influences almost every other facet of their society. A significant number of the Baweanese reside in Malaysia. In fact, the Baweanese population there far exceeds those found on the island itself, which numbers 60,000 inhabitants. 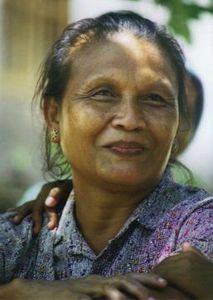 Other areas of Baweanese migration include Perth, Australia and Singapore, where they are known as the Boyanese people. Linguistically speaking, the Bawean dialect is part of the Madura language which also includes the dialects of Bangkalan, Sapudi and Sumenep. The culture of merantau creates some interesting dynamics for the Bawean people. On one hand, their homeland is isolated and cut off from modern Indonesian life. On the other hand, they are very exposed to the world through their family members who migrate and then return to the Bawean Island. The main sources of income for those living and working on the island are farming and fishing. Apart from this, some residents own small shops, make grass mats from palm leaf fiber as a local handicraft, or quarry the high quality onyx on the island for export and local sale. Most of the income on the island comes from family members who live and work overseas and send money back to Bawean. Originally the Bawean embraced animistic beliefs. Then Hindu and Buddhist influences entered the island until the 1600’s when the Baweanese people converted to Islam. Their religious devotion is extremely strong, and they pride themselves on the fact that 100% of the island’s inhabitants follow Islam. There are many mosques, small Islamic prayer houses, and traditional Islamic schools in every village. Boys and girls from six or seven years of age receive religious instruction including lessons in reciting the Quran, and sometimes live in the house of a kyai (Islamic teacher). The kyai is greatly respected by the Bawean people. Although the standard of living on the island is higher than in many other isolated locations, there are still many unmet needs. Electricity 24 hours a day has recently come to the island, as have telephones, Bawean’s first bank, and a few computers. The tourism sector is open for development in light of Bawean’s natural beauty. All of the above are assets to improve Bawean’s economy and open doors to reach out to the Bawean people.